This paper presents a quantitative framework for discussing the gas pricing policy in the countries of Middle East and North Africa (MENA) where gas prices are set directly or indirectly by the governments. It concludes that the price of gas in most MENA countries is substantially below its economic cost, resulting in wasteful use of gas and electricity, deployment of inefficient technologies, and huge burden on government budgets. The low gas price also causes a bias in favor of gas export projects while at the same time reduces investors� interest in the upstream and downstream gas sector. The implications are most interesting about four countries � Algeria, Qatar, Egypt and Iran � where each country has to revisit its gas allocation policy and where each government is trying to de-link investors� interest from domestic gas prices. In the UNFCCC process, energy exporting countries (primarily OPEC) claim compensation for losses in expected oil rent due to CO2 mitigation measures. However, there are mechanisms that may raise rather than lower the oil rent. If a carbon price is implemented universally, the cost of using oil substitutes such as unconventional oil or synthetic diesel from coal or natural gas will increase even more than the cost of using conventional oil. Here, a dynamic model that takes into account OPEC�s dominant position in the world�s liquid fuel market is developed in order to analyze these mechanisms. In this model, OPEC is assumed to act as strategic leader while all other liquid fuel producers act as price-takers. We find that the net present value of OPEC�s conventional oil rent increases by about 5% due to the carbon prices needed to reach stringent CO2 emission targets. For less ambitious targets, the increase in oil rent could be even higher. An extensive sensitivity analysis is also performed, which corroborates the main result. The price of European Union Allowances (EUAs) has been declining at far lower levels than expected during Phase I (2005-2007). Previous literature identifies among its main explanations over-allocation concerns, early abatement efforts in 2005, and possibly decreasing abatement costs in 2006. We advocate low allowance prices may also be explained by banking restrictions between 2007 and 2008. Based on a Hotelling-CAPM analysis, we provide statistical evidence that the French and Polish decisions to ban banking contribute to the explanation of low EUA Phase I prices. Besides, we provide the first rigorous empirical verification that the cost-of-carry relationship between EUA spot and futures prices for delivery during Phase II does not hold after the enforcement of the inter-period banking restrictions. This situation may be interpreted as a sacrifice of the temporal flexibility offered to industrials in Phase I to correct design inefficiencies, and achieve an efficient price pattern in Phase II. Fuelling Growth: What Drives Energy Demand in Developing Countries? 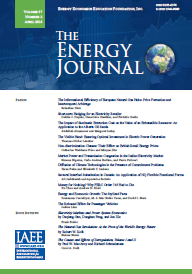 This paper investigates the relationship between energy demand, economic growth and prices in 24 non-OECD countries and three sectors from 1978 - 2003. We estimate linear and non-linear income and price elasticities, using time fixed effects to control for unobserved dynamic effects such as technological change. We also test for asymmetric responses to price changes. The analysis leads to the following conclusions. First, the income elasticity of energy demand is high and increases with income, both on the country and the sector level. Second, energy demand is more responsive to end-use price than international oil price changes. Third, the price elasticity of energy demand increases with the price level. This result, driven by the residential and agricultural sector, is new to the literature for developing countries, and is consistent with the hypothesis of stronger responsiveness to high energy prices. Finally, we find that after including time fixed effects, allowing for price asymmetry adds little to the results. This paper analyzes the market changes that occurred in California's refining industry following the 1992 implementation of the California Air Resources Board's Phase II reformulated gasoline regulations. This paper uses monthly panel data to determine the impact that these regulations have had on the disparity between California's finished gasoline rack prices and that in other regions of the country. The findings suggest that large refiner compliance to Phase II increased the rack price of finished gasoline in California as compared with other regions. This relative price increase, which was likely triggered by the increased production costs associated with Phase II, is consistent with similar results found throughout the literature. However, as small refiners were required to comply with these regulations, this analysis finds that the premium paid for finished gasoline in California increased significantly. This additional increase in the rack price differential, along with trends in industry concentration, suggests that Phase II may have disproportionately disadvantaged California's small refiners, causing increased profits and market share for larger competitors. It has been argued that the restructuring of the natural gas industry have lead to a successful deregulation. Evidence from previous studies has shown that the unbundling of gas services and the requirement of open access have made prices from various segments in the industry more cointegrated. Our results indicate that even the smallest volume natural gas customers�residential consumers have felt the benefits of the industry restructuring. 90 percent of the 50 state level city gate and residential natural gas pairs that we examined showed evidence of cointegration. Further investigation reveals that the price series for more states were cointegrated in the post 1992 period after FERC 636 (the �final restructuring rule�) was implemented and when retail unbundling started. Over the coming decades, the cost of U.S. climate change policy likely will be comparable to the total cost of all existing environmental regulation�perhaps 1-2 percent of national income. In order to avoid higher costs, policy efforts should create incentives for firms and individuals to pursue the cheapest climate change mitigation options over time, among all sectors, across national borders, and in the face of significant uncertainty. Well-designed national greenhouse gas mitigation policies can serve as the foundation for global efforts and as an example for emerging and developing countries. We present six key policy design issues that will determine the costs, cost-effectiveness, and distributional impacts of domestic climate policy: program scope, cost containment, offsets, revenues and allowance allocation, competitiveness, and R&D policy. We synthesize the literature on these design features, review the implications for the ongoing policy debate, and identify outstanding research questions that can inform policy development.